Reading Scarlet by A.C. Gaughen was a fascinating experience. The book is the Robin Hood story from the point of view of Will Scarlet, one of Robin's band of so-called merry men. Except in this rendition, he's a cross-dressing young woman. First, I was caught by the voice. Voice can be tricky in historical novels. Characters from the past shouldn't sound twenty-first century, but at the same time, making them sound nontwenty-first centuryish can also mean making them sound contrived or stilted. And while we know how people--particularly educated people--wrote in days of old, we can never really know how they sounded. The key to Scarlet's voice is that she's very ungrammatical. She appears to be unaware of the third person singular of the verb "to be," throwing "were" in everywhere. "That were Rob's version of a greeting." "'First, Freddy Cooper were arrested,'" I said, looking around. It weren't good news." Also, she uses the word "lads" for the other band members. I like the word "lad." So I liked Scarlet's voice right away. What I didn't like was when she said things like, "Rob looked at me, and as were fair usual, I felt my heart jump." I thought, Oh, no. A romance. Why must there always be a romance? I don't know if I'm going to be able to take this for long. I switched between reading Scarlet and another YA historical novel, figuring I'd stay with the one that hooked me first. As it turned out, it was Scarlet. Because I realized I would have loved Scarlet when I was a teenager. I...mean...loved it. The girl who dresses up like a boy so she can escape the restrictions of her society and be tough and strong and do exciting things? Teenage Gail loved those characters. The girl-who-is-torn-between-two-lovers scenario, as Scarlet is with Rob and someone who will remain nameless? As an adult, I find that a tedious cliche. As a teenager? Loved it. The star-crossed lovers who are always misunderstanding cues and take forever to get together? As an adult, I want to slap those characters and tell them to get on with it. But teenage Gail couldn't get enough of that Elizabeth Bennett/Mr. Darcy vibe. As I was reading this book, I felt as if I was being transported back in time. Not back into the time of the story, but back into my past. I don't think I have ever read a book that took me back to my teenage reading experience the way Scarlet did. Also, there is a great reveal in Scarlet that I never saw coming but realized immediately made sense. Plot Project: The whole Robin Hood mythology is one of those cultural things everyone seems to know about even if we can't remember why. (Maybe even more so than King Arthur, probably because Robin Hood is a much more democratic and contemporary sounding figure. He's all about redistribution of wealth, after all.) I suspect that Gaughen tweaks much of the basic Robin Hood narrative for her plot. Good story, but what is even more impressive is the situation/world she came up with to put the storyline within. There's more going on here than just making Will Scarlet a female. 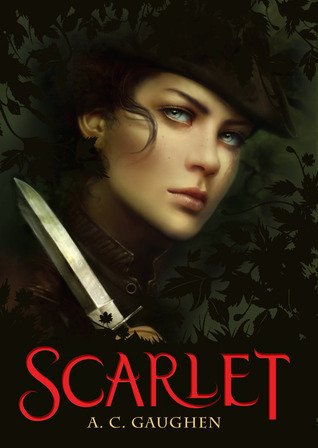 Scarlet is a Cybils nominee in the YA category. Sounds like an interesting read. Glad to have heard about it thanks to you. The love triangle is incredibly common in YA books, even in books like The Hunger Games that aren't specially romances. I don't see it that much in the adult books I read. I don't know if it appears a lot in adult romances.